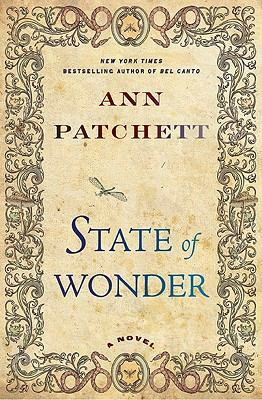 I guess I’ve been reading too much domestic fiction lately, because State of Wonder was a delightful change of pace, a novel where there’s no possibility of domesticity. It’s set in the Amazon jungle, where Annick Swenson, a brilliant, ferociously driven doctor, has been studying a very interesting phenomenon among the women of a remote tribe, a phenomenon that could translate into a wildly lucrative drug for the pharmaceutical company that’s been funding her research. Dr. Swenson is a researcher who refuses to be beholden to the crass commercial interests that provide her funding. She’s thrown away her cell phone and her infrequent letters reveal how shockingly self-absorbed and high-handed she has become. A researcher is sent to Brazil to find her but something has gone terribly wrong and he is not going to return home. His colleague, Dr. Marina Singh, must go and sort it all out. And here’s where we enter, dear readers. We accompany Dr. Singh, we see it all through her eyes: the stink and sweat of the jungle, the mesmerizing flora, the impenetrable native customs. It’s overwhelming and bewildering to Marina, but she soldiers on, hoping to unravel it all and we try to stay with her or one step ahead. It’s a great story of clashing personalities with the mystery of the jungle to lend atmosphere. Patchett’s theme is familiar, but that’s not to belittle it, just to say that she’s in very good company. Novels, plays, memoirs, and films about the (often naive) outsider trying to navigate a strange culture are legion. Along these lines, other novels that I’ve loved: Amitav Ghosh’s The Hungry Tide and Ronan Bennett’s The Catastrophist. For me, Henry James’s novel The Portrait of a Lady, qualifies, even though the setting is not exotic and the culture not ostensibly strange. I’d also add The Tempest, for plays; and Apocalypse Now as one example of a huge genre of films. Many travel memoirs exploit this theme and we love them. In The Lost City of Z: A Tale of Deadly Obsession in the Amazon, David Grann tells how he went off to the South American jungle in search of a famous vanished explorer. In Down the Nile : Alone in a Fisherman’s Skiff, Rosemary Mahoney navigates a hostile environment to accomplish her goal. I loved Erika Warmbrunn’s Where the Pavement Ends: One Woman’s Bicycle Trip Through Mongolia, China & Vietnam, where she takes on multiple cultures in her heroic journey. And for great fun, you can’t do better than God’s Middle Finger: Into the Lawless Heart of the Sierra Madre by Richard Grant. A novel that continues to resonate for me as our country continues to get mired in unwinnable, shape-shifting wars, is The Lotus Eaters by Tatiana Soli. I think many of us are armchair travelers and armchair anthropologists. I still have my old copies of Frazier’s Golden Bough and C.W. Ceram’s Gods, Graves, and Scholars. It’s the endless fascination of the new and unexplored. This entry was posted in 2011 Fiction. Bookmark the permalink.